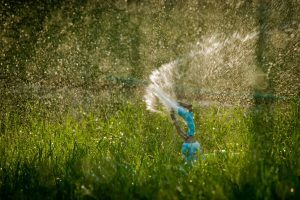 Warm weather is here and it is time to start thinking about waking up your sprinkler system from the long winter months. There are many things that can go wrong during this process if not done correctly. You have decided to try this process on your own rather than calling your landscaping service in Fort Collins. You open the supply valve wide, turn on the timer, and then stand back to watch a huge geyser erupt in the middle of your yard. It probably should have been left to the experts to ward off any mishaps. We are experienced and highly skilled to get your sprinkler system back in tip top working shape. So, what is the process of turning on your sprinkler system for the first time? Here are the steps we will take to get closer to your best lawn. Confirmation the ground is frost free for at least 12 inches. The greatest threat to your irrigation system, during initial start-up, is a surge of air pressure caused by the rush of water suddenly flowing into an empty pipe, giving the air in the pipe no time to escape. Once we have filled the entire irrigation system we will run each zone for two minutes to make sure it is running properly. The grass is always greener when you allow a professional to start your sprinkler system!